Whether you’re looking to give the exterior of your home a thorough spring cleaning, or you want to make your garage or workshop look and smell brand new, seeing a pressure washer in action is truly a thing of beauty. Pressure washers combine water, heat, and detergents at a high pressure that almost instantly wipes out even the most stubborn dirt and debris. Not only are they relatively easy to operate, but they’re also really effective on a wide variety of surfaces. And – let’s be honest here – they can be really fun to use. But just as with any other piece of equipment, a pressure washer can do more harm than good if it ends up in the wrong hands. Used improperly it could cause injury and some serious and very expensive damage to your home. If a trip to the hospital and a tower of repair bills don’t sound appealing, read on. Here’s how to pressure wash your home the right way. There’s more to using a pressure washer than just blasting everything in sight. It’s the combination of cleaning solution, water and the right choice of pressure setting that gets the job done. 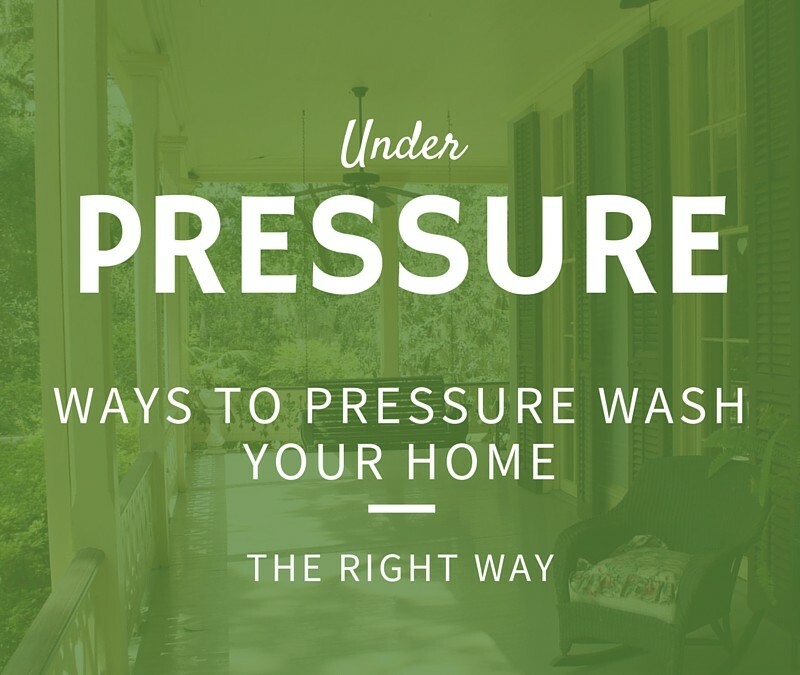 Unfortunately, many people mistakenly assume that it’s the pressure alone that does the work. Even worse, some tend to linger over the same spot when the dirt doesn’t go away immediately. This is wrong; and can cause unsightly marks or even permanent damage to the surface you’re trying to clean. Pressure washers have a selection of different settings for a reason. It’s a good idea to choose a wider fanning pattern to begin with, and to narrow it down progressively only if a wider setting doesn’t do the trick. Using the right kind and amount of solution is just as important as selecting the correct pressure setting. You probably have a whole bunch of cleaning chemicals lying around the house. The bad news, though, is that they’re probably too diluted to be effective. Of course, there’s a way around this: buying concentrated chemicals in bulk. This gives you the flexibility of being able to choose how much to dilute, and could also work out much cheaper. That said, you’ll need to be extra careful. Read the package instructions very carefully and follow them to the letter. And always, always, always wear protective gear while mixing chemicals and operating the pressure washer. Rinsing everything off is just as important as using the power washer properly and mixing chemicals in the correct amounts. Many cleaning chemicals are caustic, which means they can corrode and permanently damage your surfaces. And while some of it can be repaired, it won’t be easy or cheap. When you’re done pressure washing a surface, hose it down with clean water. Keep rinsing over and over until all the residue is gone. The store attendant might have waxed lyrical about the greatness of your new pressure washer; and it might indeed be a top quality tool. However, that doesn’t make it professional grade equipment. In fact, most pressure washers you can buy or rent out from big box stores aren’t. Professional grade pressure washers can handle higher pressure and heat than most commercially available equipment. This makes them far more effective, but also more dangerous to operate, which is why they’re not widely available. Next time your store-bought pressure washer can’t deal with the dirt, just give it a rest and call in the professionals. They have better equipment and they’re properly trained to use it the right way. And besides, why would you spend your afternoon lugging a pressure washer around when you can kick back with a cold one and get someone else to do it for you?